The Kanji (Japanese calligraphy) for Sanchin Kata translates as “three battles.” The three battles of Sanchin have been defined in numerous ways. (See Endnote # 1 for my definition). There are those that will argue over which definition of the three battles is correct. Such arguments are frivolous. Within a system of karate-do, the definition is often tied to dogmatic tenets of the system. In reality the three battles of Sanchin are unique to the individual performer. They also vary of time as the performer’s physical, mental and emotional needs change. I find that the emphasis on defining the three battles obscures an equally important characteristic of Sanchin. This characteristic is the three states of transition in performing Sanchin Kata. Please note that although these states are expressed in terms of Sanchin Kata, they also exist in the performance of every kata. The “Water state” is the default state. It is the state that is desired at all times. Like water, this state is completely flexible and bounded only by the container. As a glass contains water, a river bed contains a steam and the shores contain an ocean, the environment within which you exist at any moment in time is the sole boundary within which you are. As you define your boundary, so you define your limits. The smaller you define your boundary, the more you are limited. For example, if you define your boundary as the Dojo (or room) your are in, you are more restricted than if you define you boundary as the city the Dojo is in or the State, or the country, or planet or universe. The boundary that defines the confines of your water state is entirely up to you and you alone. The “Steam state” is a lighter, more adaptable state. As water turns to steam, its boundaries are lessened; steam flows and exists more freely than water. By adapting the steam state, you lighten any physical or psychological burden. As steam, you move easily, and more readily adapt to external stimulus. You also conserve energy to focus it when required. A burst of steam can drive a steam engine. As such, by lightening your physical and psychological state from the water state to the steam state, you to be able to focus and deliver the force contained within you. A typical movement of Sanchin Kata transitions between the states as follows; pre-movement (water state) inhalation (steam state), exhalation with dynamic tension (ice state) preparation for next movement (water state). Repeat. Within each state, the three battles, or aspects of Sanchin are omnipresent, thus they exist simultaneously in each state. A more detailed discussion of the three states of Sanchin i s included in my forthcoming book, “Life Is A Kata” available in time for Christmas, 2014. 1. For review purposes, I define the three basic aspects are, breathing, bodily movement and state of mind. On a more advanced level, I redefine the aspects as the physical aspect (breathing ad bodily movement), the spiritual aspect (state of mind & emotions) and the environmental aspect (the manner in which Sanchin connect you to your external environment). After almost four and a half decades of the study of karate-do, it is my firm belief that kata exists in and are performed in three defined states, namely a physical state, a spiritual state (which includes state-of-mind, emotions, psychological factors) and an environmental state (the manner in which the external environment affects kata and vice-versa). For many martial artists, this simple concept will be difficult to understand. Even more difficult is my proposal that given that kata embraces the three above states, bunkai, the analysis of kata, must also include these states. I designed my Kata Laboratory to provide you with specific training tools and techniques to enhance your kata experience. My Kata Laboratory is not style specific. 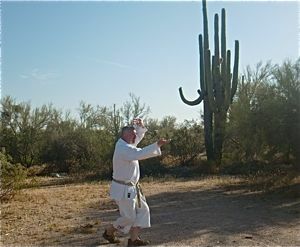 Thus my methods include any and all kata from any style of karate-do or martial arts other than karate-do. Allow me to begin by guiding you through the three states of kata. (See Endnote # 2 for an important caveat). Historically, the term kata has been amorphously defined. I submit that a full understanding of kata is achieved not by attempting to define kata, but by first simply parsing kata into its most fundamental elements and second, regrouping the fundamental elements into the larger states of kata. On an elemental level, the two elements of kihon (basic techniques) and the two elements of zazen (seated meditation) combine to form the three elements of kata. The term “Bunkai” has been commonly, and improperly, interpreted as “practical application” or “application”. Not only is this interpretation misleading, it tends to confine one’s analysis of kata solely to physical applications. A more correct translation of bunkai is “analysis” or “disassembly”. Preliminarily, it is interesting to note that the improper translation of “practical application” or “application” infers a passivity to the study of bunkai. By this I mean that one may be taught an application of a kata by another. Thus, the student need not expand any intuitive effort. The student need only learn, and robotically copy the application as taught by the teacher. Analysis, on the other hand, demands action, one cannot be passively taught analysis. One must actively analyze. 3, hidden, or as I like to say “introspectively-intuitive” bunkai (deeply covert and highly subjective, technique is discovered by and works for the individual performer). A practitioner is free to engage in the depth of bunkai as he sees fit. It is a question of personal satisfaction as to how superficially or deeply one desires to study kata and physical bunkai, if at all. As one progresses from basic to intermediate to advanced the level of individual commitment, toil, self-discovery and introspection increases. In my experience, few practitioners are sufficiently committed to this arduous process. Given the increasing level of commitment, physical energy, mental acuity and intuition required to progress from the basic physical bunkai to the intermediate and introspective-intuitive physical bunkai, it is not surprising that a select limited number of practitioners have endeavored to conceive, yet alone explore the spiritual bunkai (analysis) of kata. It is commonly recognized that the masters of old expressed the concept that the highest aspiration of karate-do is spiritual in nature. (See Endnote # 6). In my kata laboratory, it is fundamental that once you have engaged in a deep, and prolonged exploration of the physical bunkai of kata, the spiritual bunkai begins to be revealed. This phenomenon; however, only begins to manifest itself with continuos, progressive, intuitive and demanding analysis of physical bunkai in a never ending, but always expanding process. Simply put, it is not a practice that develops over-night, when it is convenient or without thinking, sweating and experimenting over many years. It is an arduous journey. This manifestation of spiritual bunkai commences with a basic level. As in the case of physical bunkai, spiritual bunkai has the same three progressive levels of basic, intermediate and introspectively-intuitive (hidden). In a similar fashion, environmental bunkai (the manner in which one interacts with the external environment) will begin to manifest itself at a basic level. That is to say that when a practitioner continuously explores both the physical and spiritual bunkai of kata, the environmental bunkai will begin to be self-evident. It is therefore mandatory to train and experiment with bunkai not just within the physical state, but also on all states of the kata itself. Thus, since kata exists in the three states of the physical, the spiritual and the environmental, bunkai must also exist in the same three states. Bunkai, must be conducted on all three levels commencing with the readily discernible physical stage to the difficult spiritual stage and the environmental stage. To this end, future submissions in my kata laboratory category will guide you. First, begin your kata practice session by performing Sanchin Kata so as to augment your awareness of the three battles, or states of Sanchin, namely a physical state (breathing and bodily movement), a spiritual state (state-of-mind) and an environmental state (interconnection with the external environment). Next, proceed to practice your other kata, paying particular attention not only to the physical state of the kata, but also being aware of the spiritual state (state-of-mind) enveloped within that specific kata. You should pay particular attention to discovering the state-of-mind to be found within each different kata. It is mandatory that bunkai (analysis) of kata progress from the physical state to explore the spiritual and environmental states of kata. Thus, bunkai (analysis) will exist within the three states of kata. 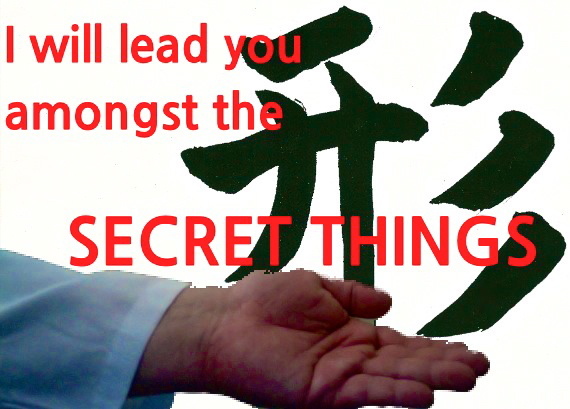 Given that bunkai is limited by the majority of practitioners to the physical aspect of kata, the uncommon nature of the spiritual and metaphysical aspect of bunkai makes them the “secret things” worthy of analysis. Future editions of Sensei John’s Kata Laboratory will contain defined analysis as to how to accomplish the task of analyzing kata on three levels, the physical, the spiritual (state of mind) and the environmental (synchronizing with the external environment). 1. Alighieri, Dante, Inferno, Canto III. 2. Caveat: the term kata is not restricted solely to kata of karate-do, by functional necessity, the term must also include the kata of all martial arts regardless of nomenclature. Thus, the within applies to the kata of Tae Kwon Do, Kung-fu, Kendo, Kobudo and the like equally. 3. By definition, zazen (seated meditation) does not have the element of bodily movement. 5. States of mind include not only martial arts states of mind, for example Mushin (mind-no-mind), Nenjjushin (everyday mind) and Tomaranu Kokoro (unstoppable mind), states of mind also include the common, non-martial states of mind such as depression, anxiety, alertness, joy, sorrow, envy, greed and the like. While the three states exist in every kata, they are codified and amplified in the kata Sanchin. Close scrutiny of the three battles of Sanchin illustrates the inconsistency and redundancy within which the battles have commonly been defined. My research into, practice of and examination of the three battles of Sanchin results in the commonly accepted three battles being rejected and redefined as the physical battle, the spiritual battles and the environmental battle. 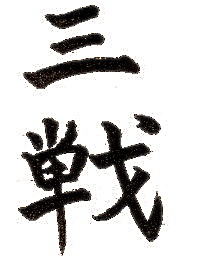 The term “battles” as represented by the kanji for Sanchin, is representative of the “states” of human existence. Thus the three battles of Sanchin represent the three states of human existence. For seminar information, please use the following link: https://senseijohn.me/seminar-kata/ For information on my Sanchin DVD and Book, please see the notes below. 8. A full dissertation of the masters expression as to the spirituality of karate-do is beyond this article. Quite frankly, if the reader does not comprehend this concept, then, unless it is too late, he or she needs to acquaint him or herself as to this concept.